The Chief Security Officer (CSO) to the Governor of Rivers State, DSP Promise Nwosu was removed because of his involvement in partisan politics, the police said. The Force Spokesman, DCP Don Awunah, in a statement in Abuja on Wednesday while noting that officers are insulated from partisan politics added that the Inspector General of Police (IGP), Ibrahim Idris has set up an investigative inquiry to ascertain the level of Nwosu’s open engagement in political activities, disrespect to senior officer and unethical practices. 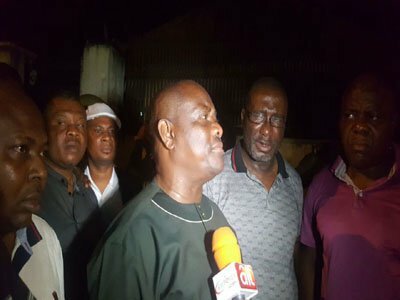 According to the statement: “The Nigeria Police Force have observed the innuendos, distortion of facts and wild allegations peddled in the mass media following the redeployment of the Chief Security Officer (CSO) to the Governor of Rivers State, DSP Promise Nwosu, as a result of gross professional misconduct. “It will be recalled that on 17 November, 2016 during peaceful demonstrations of an opposition party in the state, All Progressive Congress (APC), the Chief Security Officer to the governor, DSP Promise Nwosu was found among the protesting party faithfuls in a manner prejudicial to discipline and displaying conduct unexpected of an officer of his calibre and office. The statement further read: “The CSO to the governor, when challenged by a superior officer demonstrated brazen indiscipline and showed disrespect to the senior officer, exhibiting conduct that violates all known norms of the force. “Accordingly, the CSO was officially queried for discreditable conduct, insubordination, engaging in partisan political activities, illegal duty and act unbecoming of a public officer. “As a result of such gross misconduct and apparent partisanship, the IGP ordered the redeployment of the CSO pending further disciplinary action. To this end, the IGP has also constituted an investigative inquiry into the officer’s open engagement in political activities, disrespect to senior officers and unethical practices”. The IGP while restating that the Police and police officers are insulated from partisan politics warned all police officers in any capacity to desist from acts that portray the force in a bad light and question the integrity of the personnel. “Any police officer, especially CSOs, Aides-de-Camp (ADCs), and orderlies attached to political officer holders or senior government officials who engages in activities outside the official schedule will be removed and made to face severe disciplinary action”. The police also stated that Governor Nelson Wike is free to choose who his CSO from the Command. “The Governor as Chief Security Officer of the state is at liberty to select any officer of his choice from the strength of the command to serve as his CSO but under no circumstance should any officer abandon the security of his principal and legitimate duties to engage in direct partisan politics or conversely should any political office holder use police officers attached to them for political machinations”.